Equipped with a cart for portability and convenient accessory storage, the Lincoln Electric Precision Ready-Pak TIG 225 TIG Welder delivers a power range of 5 - 230 Amp for versatility and features the TIG Pulser for reduced warping and burnthrough on thin materials. AC Auto Balance automatically sets the optimal cleaning vs. penetration levels for great looking aluminum welds and a TIG torch, gas regulator, amperage foot control and other accessories are included for added value. 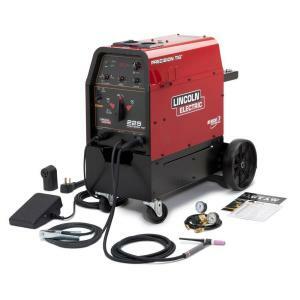 Tbook.com crawls the web to find the best prices and availability on Welders and related Tools and Hardware products like Lincoln Electric 230 Amp Precision TIG 225 TIG Welder Ready-Pak w/Cart, Single Phase, 208V/230V. For this page, related items include products we find that match the following keywords: "Welder|Welding" at our vendor partner Home Depot. Lincoln Electric 230 Amp Precision TIG 225 TIG Welder Ready-Pak w/Cart, Single Phase, 208V/230V is one of 184 Welders and related products listed in the Tools and Hardware section of Tbook.com If you have any questions on this product, please give us a call at 734-971-1210 during the hours of 9am - 5pm EST for assistance. Thank you for shopping at Tbook.com, the Internet Department Store!